All Hail The Top Dog! The votes are in … and in the most-voted Final in Longbox Graveyard March Madness history, #11 seed Lockjaw completed his Cinderella run to the championship by besting top seed Krypto by a single vote! I am fairly surprised by this result … I rated Krypto the #1 seed in the tournament, and I voted for the Dog of Steel in every round, including the Final. I would have exercised by editorial discretion and awarded Krypto the victory in the event of a tie … but a vote came in for Lockjaw at literally the last moment, and history was made! This is why we “play the games” — sure things are rarely sure things, and these tournaments wouldn’t be much fun if they didn’t allow for the possibility of upsets! In retrospect, I clearly had Lockjaw seeded too low at #11, failing to account for the popularity afforded by his role in the contemporary Ms. Marvel series … just another peril of your editor permanently residing in the year of 1978! But no matter the circumstances or the seeding, Lockjaw is the winner of the Longbox Graveyard March Madness Super-Animal Showdown! Share your reactions to Lockjaw’s big victory in the comments, below … and start stumping for the topic of the 2016 March Madness! Should we face down Super-Apes? Super-Villains? How about the greatest comic book aliens (Silver Surfer vs. Martian Manhunter in the final?) Let me know your thoughts … and thanks for your enthusiastic support of the Longbox Graveyard March Madness Super-Animal Showdown! March Madness Super-Animal Showdown — Championship! Our March Madness Super-Animal Showdown has reached its climax! The Final Four saw Lockjaw handily beat Devil Dinosaur, while top seed Krypto had his paws full with Howard the Duck, who led much of the week before fading down the stretch. The stage is set for a truly dog-eat-dog final! Get voting, and get commenting! This is the moment of truth! March Madness Super-Animal Showdown — Final Four! The NCAA Basketball Tournaments may be calling it quits, but the March Madness Super-Animal Showdown is just getting to the good stuff! Our Final Four is set after a quarterfinals round that saw favorites Krypto and Howard the Duck cruise into their semi-final matchup, while underdogs Devil Dinosaur and Lockjaw both scored upsets to set the stage for an all-Kirby semi on the other side of the bracket! Let’s meet our Final Four! #1 overall seed. Defeated Max, G’nort, and Comet to reach the Final Four. First appearance: Adventure Comics #210 (March 1955). Created by Otto Binder and Curt Swan. #4 seed. Defeated Hoppy the Wonder Bunny, Throg, and Gorilla Grodd to reach the Final Four. First appearance: Adventure Into Fear #19 (December 1973). 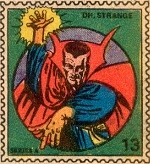 Created by Steve Gerber and Val Mayerik. #7 seed, and entered the tournament as a “play-in” candidate, having been passed over in the committee’s initial seeding. Defeated Titano, Mr. Mind, and Rocket Raccoon to reach the Final Four. First appearance: Devil Dinosaur #1 (April 1978). 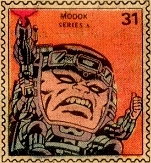 Created by Jack Kirby. #11 seed, and the lowest seed still standing, wearing Cinderella’s glass slippers on all four of his floppy feet. Defeated Lockheed, Ace the Bat-Hound, and the Teenage Mutant Ninja Turtles to round out the Final Four! First appearance: Fantastic Four #45 (December 1965). 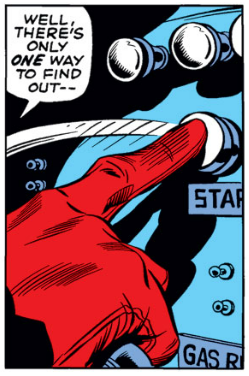 Created by Stan Lee and Jack Kirby. All right … you know the drill … it’s time to vote for your favorite Super-Animals! Here are the semi-final matches! Here’s your up-to-the-second tournament breakdown! Some tasty match-ups here … and the Final is going to be amazing! Meet me back here next week for the championship match, and be sure to cheer on your favorite in the comments section, below!